Do you realize we are half-way through January? Just when you thought the holidays were behind you . . . here we go again – It’s less than one month until Valentine’s Day! I love Valentine’s Day because its just the perfect opportunity to let people in your live know you care. Here’s what’s great about these adorable little pies. These little gems use a crumb pie crust that is super easy to make and canned cherry pie filling. Easy-Smeasy! The recipe is actually our Cherry Crunch Pie which you can find here. 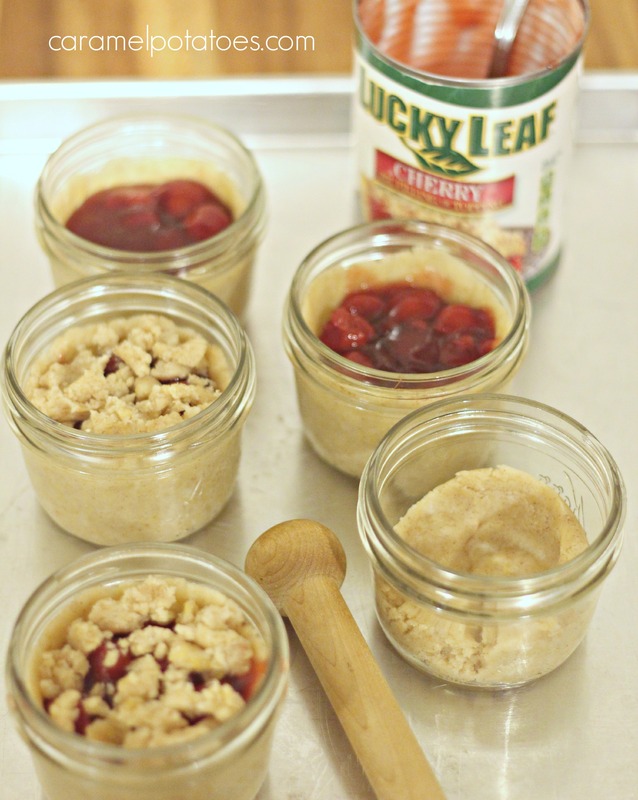 No worries about rolling out pie crust – just make the crumble mixture and press into the jars. We’ve also made an adorable Valentine Printable Gift Tag to add to your jar for simple and easy gifting to whomever is on your Sweet List. Because I know you are going to ask, I got those super cute wooden spoons on Etsy from The Bakers Confections – don’t they just wrap things up perfectly! Preheat oven to 350 degrees. Spray mason jars lightly with cooking spray. Mix all ingredients except pie filling in a bowl until it forms a crumble. Use about 1/4 cup (packed) crumble mix in each jar. Press the crumb mix into bottom of the jar with a tamper if you have one or a small cup. Then use your fingers to press it up the sides. ending just below the lid rings. Set remaining dough aside. Spoon cherries equally into your five jars. Crumble a little topping on top of the pies – leaving a little red showing. NOTE: you will not need all the crumb topping, there will be a little left over – you can bake it like a cookie if you like. Bake on a sheet pan for 30 -40 minutes or until golden brown. Allow to cool before putting lids on. 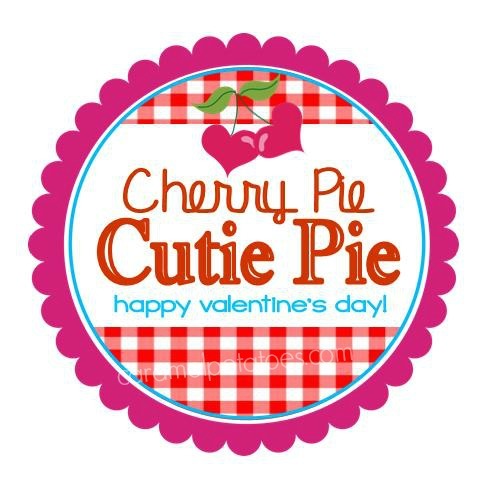 DOWNLOAD The Cherry Pie Cutie Pie Printable here. 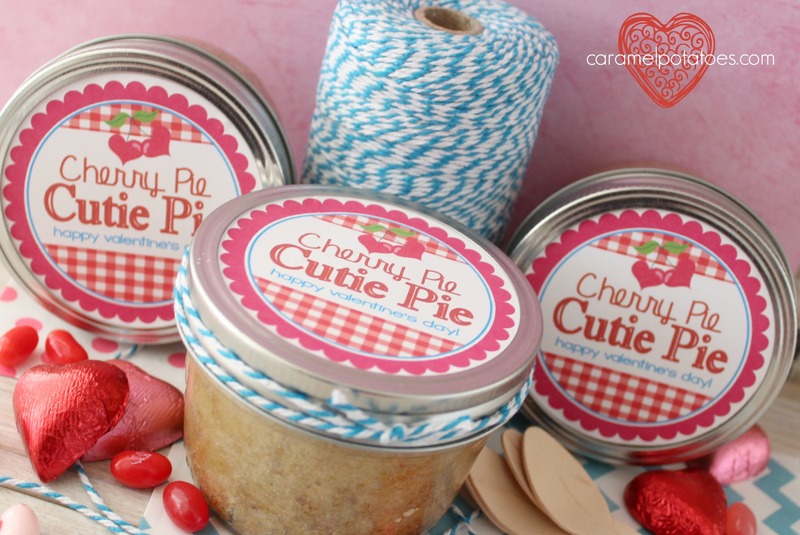 Who are you going to treat to a Cherry Pie Cutie Pie?? I love this. Can’t wait to make these ! Thanks. Every holiday I look forward to seeing what new printable you will have. I think this is my favorite. Angela. They are 8 ounce jars. There is an amazon link in the recipe post. They do make 4 oz jars that look the same (short and squaty). Good luck. Let us know how they turn out for you! can you seal the jars as if canning for long term storage on the shelf? Jenny – I have never tried to seal them for long-term storage. 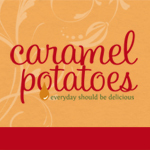 I would recommend making them a day or two before your event! Let me know how they turn out for you! 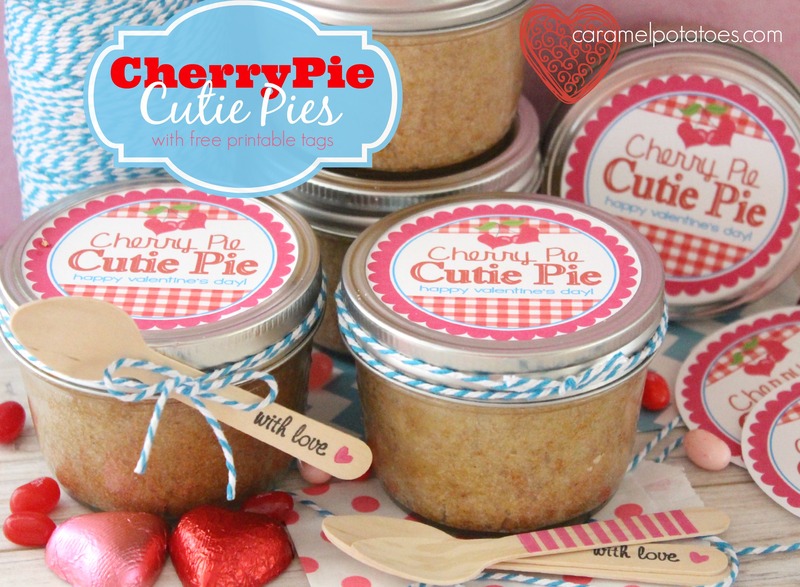 Hey there, I am featuring your Cherry Pie gifts on my Valentines Gift Round Up. The post should be live sometime tonight. Ooo… love this idea! Will be great to use dor March 14! You know, pi day? 3.1415926 (think math).